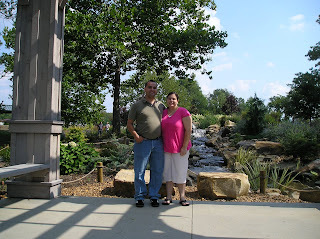 At the end of August we made our way to Kentucky for Jeff and Kibbie's wedding. Tim and Bro. Kevin just had to make a stop at the creation museum so went early to sqeeze it in. It was really good and at the end they even give a salvation message and give a chance to get saved. It was fun and Tim was like a kid in a candy store. 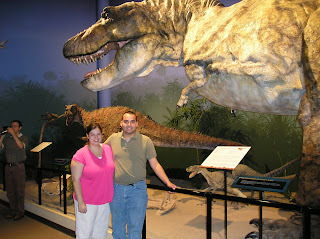 Us next to the big T-Rex. 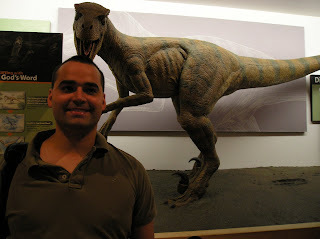 It looks like this dinosaur is about to eat Tim's head. They have a beautiful garden and outside area. 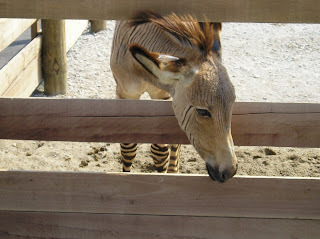 This is a Zonkey, I think. It is a donkey and zebra mix. The zorse was cuter, but he wouldn't let me get his picture.